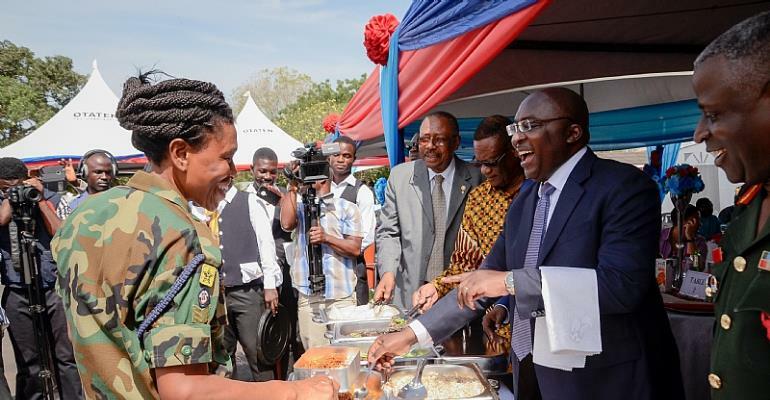 The Vice President, H.E Dr. Mahamudu Bawumia, Wednesday afternoon put away his well-earned reputation as a scholar to don the garb of a chef when he served lunch to officers and men of the Ghana Armed Forces at Burma Camp, Accra. The Vice President showed his serving skills after delivering an address on behalf of President Nana Akufo-Addo at the 2017 General Headquarters West African Soldier Social Activities (WASSA) on Wednesday February 21, 2018. The programme was attended by high profile dignitaries including the Minister of Defence Hon Dominic Nitiwul; Majority Leader Hon OseiKyeiMensah-Bonsu and his colleague Minority Leader Hon HarunaIddrisu; serving and retired Service Chiefs including former Chief of Defence Staff Brig General NunooMensah, and the Founder of the Salt and Light Ministries, Dr Joyce Aryee. Service Chiefs and Heads of other security services, Generals both Serving and retired, Defence Attachès and other members of the Diplomatic Corps and members of the Armed Forces Council were also present. 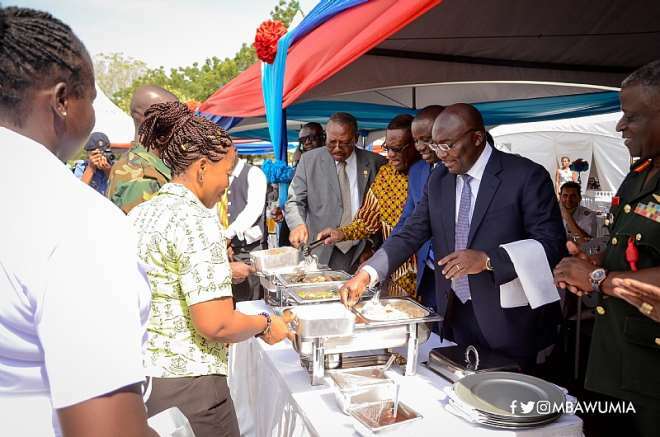 It was all light hearted fun as the soldiers lined up to receive their helpings of either banku, jollof or fried rice from the ladle of the Vice President. Dr Bawumia had earlier conveyed on behalf of President Akufo-Addo, Government’s appreciation for the sacrifices the men in uniform had made and continue to make in the discharge of their duties, and pledged the provision of vehicles and other logistics to facilitate their work. WASSA is an annual event celebrated by the various arms of the Ghana Armed Forces - Army, Navy and Air Force - which brings together family members to fraternise and in an informal setting in order to strengthen the bonds of comradeship.